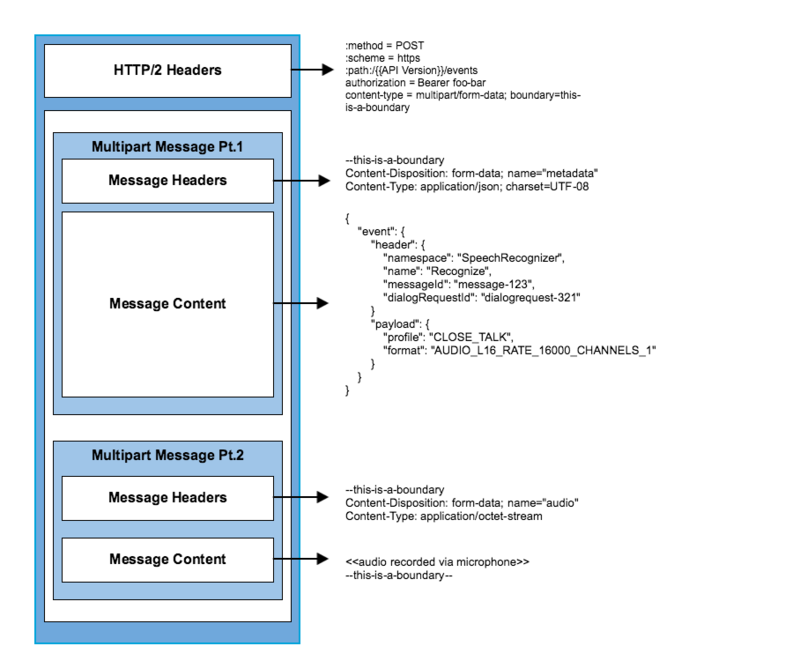 Once a connection with the Alexa Voice Service (AVS) is established, your client will communicate with the Alexa using HTTP/2 encoded multipart messages. The events sent from your client, as well as directives sent by Alexa, specify actions that the server or client should take. The following diagram illustrates a Recognize event sent to AVS. The multipart message is composed of two parts. The first, a JSON-formatted event, the second, captured audio from a product's microphone. For information on creating and maintaining a connection, see Managing an HTTP/2 Connection. The scheme for accessing the AVS API is https. When a user authorizes your product to access Alexa on their behalf, Login with Amazon returns an access_token which is then used to make calls to AVS. The access_token must be included in the header of each request. AVS expects HTTP/2 encoded multipart messages. Multipart messages are composed of one or more JSON-formatted directives/events and their associated binary audio attachments (if required). In this section, we'll review the structure of a multipart message sent to AVS. Each event has a unique header and payload. In the header, namespace and name identify the interface and the event, and messageId is a unique identifier your client must send with each request. For additional information and samples, see API Overview. This part of the multipart message is binary audio. The only event that requires an audio attachment is a Recognize event. For detailed information, see SpeechRecognizer Interface. AVS will send two types of responses to your client. The first type, like requests, are multipart messages composed of one or more JSON-formatted directives and their associated binary audio attachments (if required). The second type are exceptions. Exceptions are not multipart messages and are returned to your client when an error occurs. Each exception will include an error code and a description. For additional information, see Exceptions. This example shows a Recognize event that receives one Speak directive as a response. This example shows a Recognize event that receives one Speak directive and one Listen directive as a response.